I’m just going to come out and say it…this dish will blow you away! It’s contains so many of my favorite ingredients…spaghetti squash, my new pesto, olives, tomatoes, mushrooms, and fresh herbs. I’m very excited to be sharing this Mediterranean Spaghetti Squash recipe with all of you today. 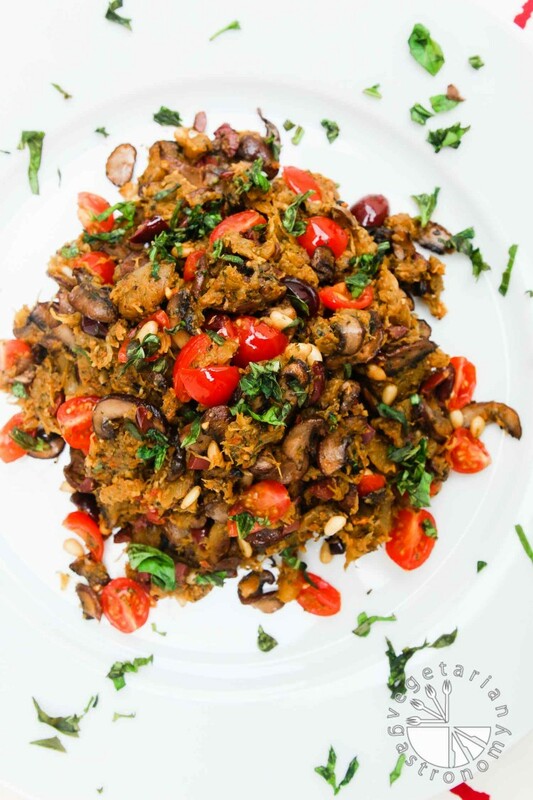 It’s loaded with healthy plant-based ingredients and flavors that pair so well together that you’ll find yourself devouring the entire serving in one sitting. So now that I’ve sold you on how easy it is to roast a spaghetti squash (if you weren’t already on-board), go get one the next time you’re at the grocery store. Grab that Sun-Dried Tomato, Miso, Basil Pesto that you have stored in the freezer (which you hopefully made after my post 2 weeks ago) , or any other favorite prepared pesto, roast some mushrooms (don’t skip this step), and make this dish. If you already have the pesto on hand and roasted spaghetti squash in the fridge, it’ll only take you about 20 minutes to have this gorgeous plate of in front of you. I’d love to hear what you think in the comments below or see your pictures of this recipe recreated and posted on Facebook or Instagram (don’t forget to tag me so I don’t miss it)! 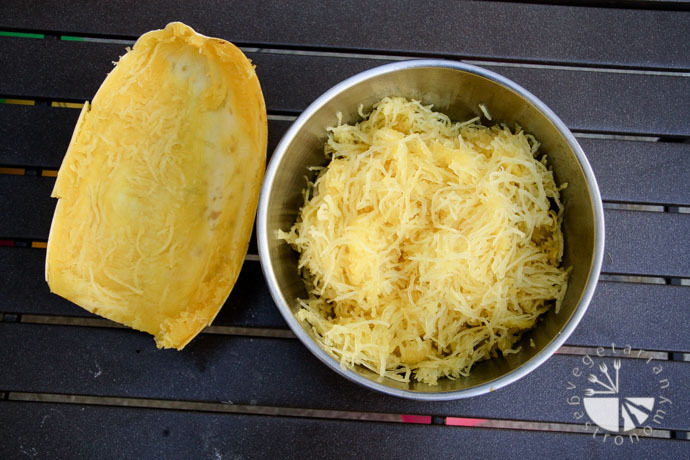 What’s your favorite dish containing spaghetti squash? 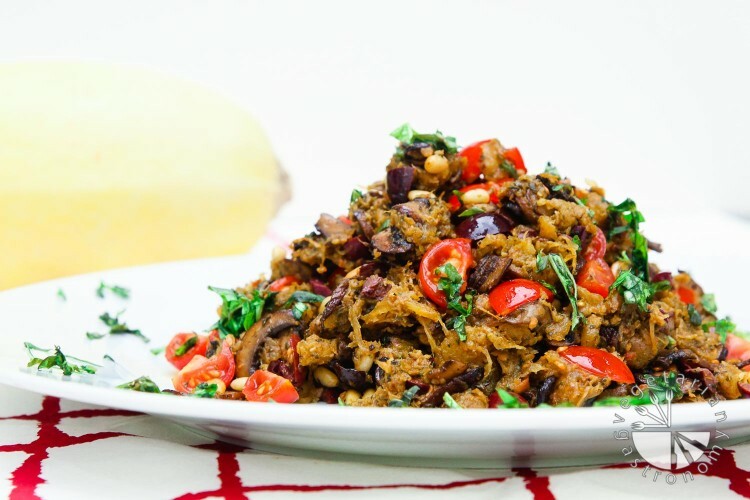 This spaghetti squash dish is the perfect side at your next party or light meal! It's loaded with veggies and flavor. Cut the spaghetti squash in half and scrape out all of the seeds (I like to use my ice cream scoop for this step). Sprinkle both halves with a little sea salt and freshly ground black pepper. Place each half face down on a baking sheet lined with parchment paper . Bake for 25-40 minutes or until a fork or knife pierces through easily. Be sure not to over-bake the squash, otherwise you may not get strands out. Depending on the size of your squash it may take more or less time to bake. While it's baking, prepare the rest of the ingredients for the dish. Once the squash is cooked, remove from oven and cool until you are able to handle it. Do NOT turn the oven off. While you are waiting for the spaghetti squash to cool, roast the mushrooms in the oven, directions below. Once cool enough to handle, scrape the insides of the spaghetti squash out using a fork so that you create "spaghetti"-like strands. For this recipe, you should end up with ~4 cups spaghetti squash. 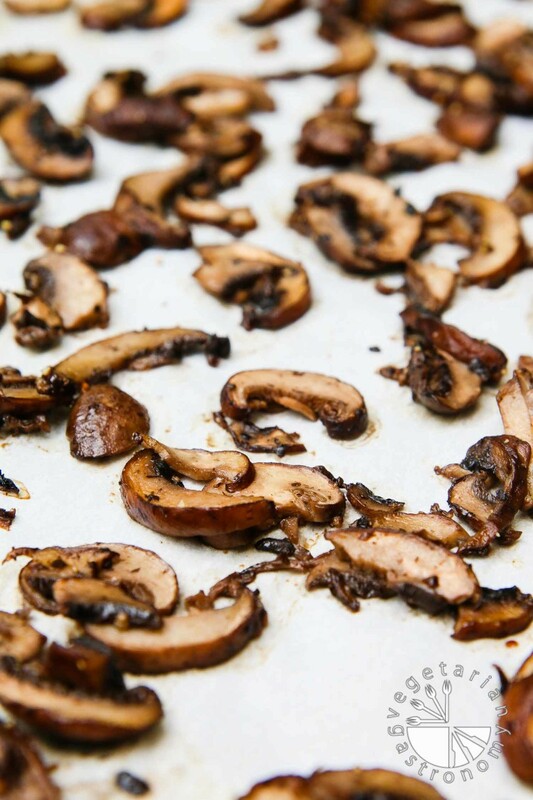 Toss the mushrooms with a tiny amount of olive oil, salt, and pepper. Place them in a single layer on a parchment lined baking sheet . Roast in the oven for 10-15 minutes at 400 degrees until the water is released and the mushrooms just start to brown. Remove from oven and cool. In a large non-stick pan, on medium heat, combine the cooled spaghetti squash strands (~4 cups) and prepared pesto. Toss until all the pesto is mixed in. Turn the heat on medium-high and spread out the spaghetti squash in the pan. Let it cook, heat through, and possibly crisp up a little for about 3-4 minutes, flipping often with a spatula if needed to avoid burning. Turn the heat down to medium. 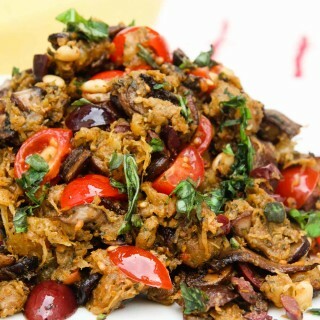 Add in the rest of the ingredients (chopped cherry tomatoes, chopped kalamata olives, roasted cremini mushroom slices, pine nuts, and chopped fresh basil leaves). Slowly combine and heat for another 5-10 minutes using a spatula to toss. Season with salt or freshly ground black pepper to taste (note: my pesto was well seasoned so I did not need any additional salt or black pepper). To save time, I typically roast the spaghetti squash the day before if I have time and store the roasted spaghetti squash strands in the fridge. I also make a large batch of my pesto and store it in the freezer to use as needed. Prepared Pesto - I make my Simple Pesto or Sun-Dried Tomato Miso Basil Pesto recipe and store it in the freezer. 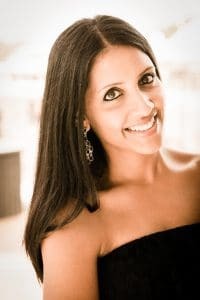 Thank you Rashmi! I know the colors and flavors are great in this dish! Your dish sounds like my Spinach Cheese Spaghetti Squash Casserole that I have up on the blog (it's one of the more popular recipes) I used to make it all the time before going vegan. I came up with an alternate vegan sauce for it, so I'm excited to try it again!! So nice that they have spaghetti squash in SA...i had no idea it had another name. 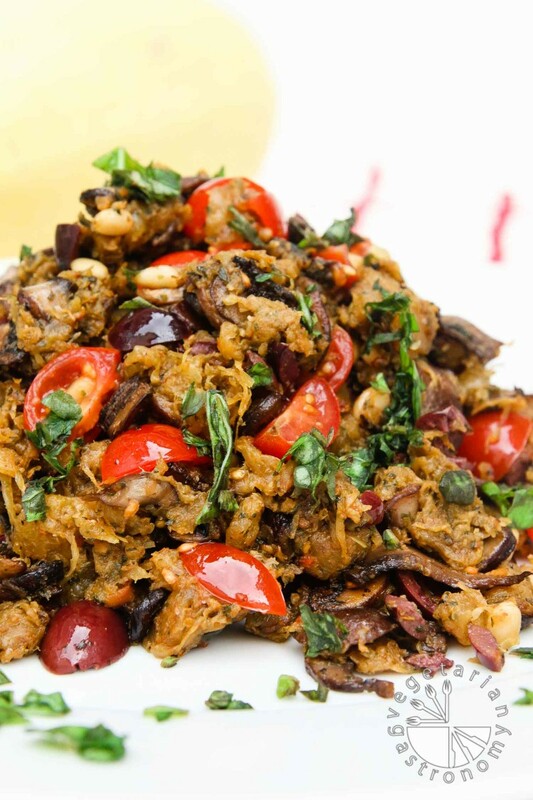 This dish looks amazing Anjali and soo flavourful.. A total party in your mouth.. YUM! This one definitely has a LOT going on, but it's SO good! I love all the flavors in this dish! Thanks Reshana! So, I had to rush right over here to check this out after you commented on my post. My gosh, this looks delicious! That pesto!!! And roasted mushrooms are like candy to me. Next time I have a spaghetti squash in the house, I'm making this! Yum! Thank you SO much Stephanie, this is one of my favorites so I'm glad you loved it as well! I constantly have toddlers tugging on me as well so can definitely relate =) I'm sure the roasted red peppers and pecan subs tasted great in this recipe as well. Thank you for trying out my recipe and following...loved seeing the picture of the final product on IG! So glad you loved it Ammie! 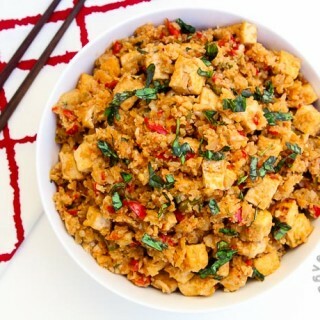 Thanks so much for trying it out...one of my favorite meals so flavorful and filled with all kinds of great ingredients! I have somehow never had spaghetti squash, but this looks like a perfect intro into the recipe world using them. Love all the other veggies and the fact you could enjoy it hot or cold! Ah! 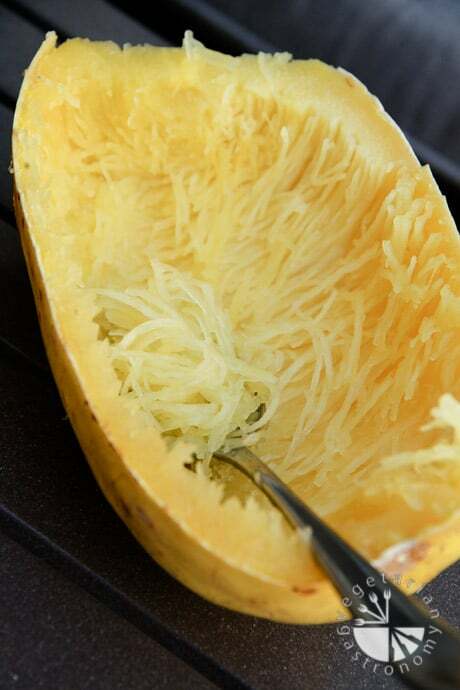 Spaghetti squash is so awesome! You have to try it...even if you just split it in half, remove the seeds, sprinkle with salt and pepper and baked it till tender! I guarantee you'll be devouring the spaghetti squash straight from the oven like i do! Great Spaghetti Squash recipe! Bookmarked for future testing. If this turns out how I hope will have to add it to my next top 10 spaghetti squach recipe post. 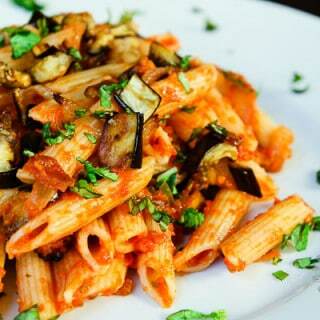 Love all the veggies in this!